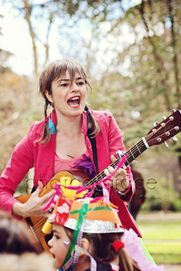 Amy Jo Doherty en concierto para niños en inglés . Lugar: CRECER JUNTOS CON ARTE. C/ Rodriguez Marin 90. 28016 Madrid. Fecha: domingo 22 de febrero de 2019, 18:00h. Porque aprender inglés ya no tiene que sonar aburrido sino a rock and roll! Shake Rattle & Roll Sing-a-Long is a fun, belt-’em-out session for babies and children under 5. It lasts 45 minutes and we always aim to start and finish with a big smile. Each class starts with our welcome song and then the children are free to choose their favourite nursery rhymes, brought to life with props, actions and cardboard cut outs. The next part of the class is more energetic and we focus our attention on developing self-control, co-ordination and awareness of space. A variety of popular and original action rhymes and chants are used for this. Then come THE SHAKERS!!!! This part of the session is a sing/shake-a-long with the guitar and a mix of the traditional children’s songs and adaptations of adult songs – expect to find yourself singing along to the music from your favourite films, The Beatles as well as the Wheels on the Bus and other favourites. And we finish with everyone up on their feet. Enjoyment of music can be learned from movement and experimenting with our bodies PLUS it’s a great way to bond with your child, so get dancing…show us what those hips can do! The groups are run by AmyJo, a qualified Early Years teacher for over 10 years and also an English language teacher, musician and songwriter. Más información Shake Rattle & Roll: www.shakerattlerollmadrid.webs.com y página de facebook www.facebook.com/ShakeMadrid.